The world around us never ceases to amaze. Knowledge of the environment and learning to value and protect it are the main objectives of the Natural Sciences classes. It helps to awaken students’ wonder at Creation and establish a scientific and technological culture that fosters critical thinking. This subject is taught differently in the various age groups. For Pre-School students, images are used. For 1st, 2nd, and 3rd year Primary School students, Science is taught in English, with group work playing a significant role. For students in 4th year Primary School and above, the course is taught in Spanish so that students acquire a rich vocabulary in their own language. For Secondary School and Baccalaureate students, Biology takes on an important role, with a scientific methodology being developed through research, direct observation, experimentation and the formulation of hypotheses. From 4th year of Secondary School, the subject is optional and offers students the opportunity for various types of laboratory work with the additional subject Further Biology also available. For all age groups, classes are enriched by providing additional learning through activities outside the classroom, such as excursions, botanical workshops, guided tours and exhibitions. 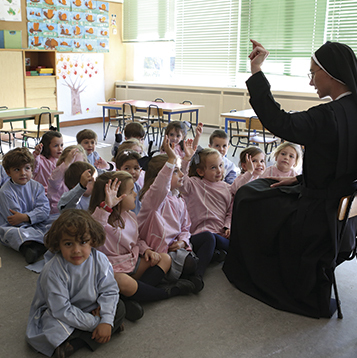 The School offers the “Culture on the Stage” classes to Primary School students as part of the internal English project, with the aim of providing linguistic immersion. The primary aim of this subject, which is taught solely in English, is to provide direct knowledge of British culture and its customs, including music, literature and gastronomy. Culture on the Stage seeks primarily to ensure that students are able to communicate naturally and spontaneously in English. For this reason, the methodology includes a wide variety of resources: songs, poems, drama, group work and so on. Technical Drawing is taught in the 1st and 2nd years of Baccalaureate. The course content is divided into three broad sections. The first focuses on plane geometry. The second looks at the various systems of representation. The third centres on normalisation and ends with an introduction to the different computer-assisted drawing programs. The conceptualisation of architectural space. The handmade and industrial production of parts and assemblies. This course begins with the fundamentals of Design, providing students with the necessary building blocks for accessing cutting-edge professions wit wide scope for future development. This subject is primarily based on practical and experiential learning. 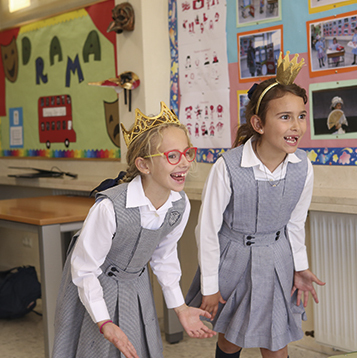 As part of the internal English project, Mater Salvatoris School offers Drama as an innovative learning tool. The Drama course aims to provide a fun, inspiring and entertaining way of learning English. Theatre is an extremely effective tool for stimulating intellectual and emotional development, since it encourages active participation, sparking interest and an appetite for learning. Drama classes are taught solely in English, compelling students to think in the language. The aim is that they speak, play, interact and enjoy themselves in English, within a group setting. In this way, vocabulary and grammar are learned naturally, directly and intuitively. Since the year 2000, our Baccalaureate students have been offered the opportunity to study Economics and Business Administration. The growing interest in the subject, the wealth of knowledge imparted and the incredible entrepreneurial spirit demonstrated by many students provide daily inspiration to continue successfully teaching this exciting area of study. Endeavour, drive, tolerance, respect and team spirit are just some of the fundamental qualities and values we hope to transmit to our students. For this reason, Physical Education forms an integral part of the School’s education project. 3 rhythm and psychomotor halls. 3 gymnasiums, each adapted to different requirements. Because of its importance for personal development, sport is practised at all educational stages of the School. English Culture forms part of the School’s internal English project. This subject is taught in the 5th and 6th years of Primary School, when students have already acquired an extensive vocabulary, teaching them to use it naturally and spontaneously. The aim is to encourage a mastery of English so that students are able to apply the linguistic resources already acquired to their communicative processes. The English Culture course focuses on comprehension and oral production, using as a basis the history of the United Kingdom and its key figures, as well as the customs, traditions, geography and literature of the English-speaking world. The development of critical thinking is crucial in terms of assessing and reflecting on the world around us. The Philosophy course helps students to lose their fear of thinking for themselves, make reasoned arguments, and gain knowledge of the roots of Western thought. To know where we are heading we must know where we have come from. This subject is available to 1st and 2nd year Baccalaureate pupils. It includes the study of various branches of Philosophy (metaphysics, logic and the theory of knowledge, ethics and aesthetics) and the key figures in the History of Thought. Physics is the master key for understanding how the universe works. Students of Physics come face-to-face with real-life problems rather than mere abstractions. As such, an understanding of this topic opens students’ eyes to the world around them, making everything clearer and more accessible. As early as the introductory courses, problems are combined with practical experiments in the laboratory, providing students with the most comprehensive scientific training possible. Throughout history, French has been one of the most influential languages in terms of culture and art. Possessing a second foreign language is a vital tool in our globalised world. The French course is taught in smaller groups in order to create flexible, dynamic and interactive classes. All students receive the appropriate preparation for obtaining the DELF (Diplôme d’Etudes en Langue Française), a certificate issued by the Institut Français in Madrid, a Ministry of Foreign and European Affairs Official Centre. It is not just a language. Students learn French as a second foreign language from the beginning of their Secondary education studies. The subject is not solely aimed at learning the language, placing a significant emphasis on knowledge of French culture, through film viewings and the study of other art forms such as music and poetry. “History should be a tool for improvement and should be used to achieve the utopia and desire for transformation so coveted by humanity”. These words from the historian García de Gortázar sum up what it means to study History at Mater Salvatoris School. History is the science that studies how mankind has lived in the past. It describes, explains and interprets the events and social processes that have occurred in human societies. Thus, it provides knowledge about the evolution of societies across time. The methodology used is adapted to the various age groups. It aims to develop different aptitudes, from the comprehensive and strategic reading and assimilation of texts, to the analysis and interpretation of different historical sources (texts, images, maps, graphics and so on). History of Art is one of the most popular subjects among our Baccalaureate students. The course aims to impart knowledge about the changes that have occurred over time in terms of the perception of Art. Students must learn to value these changes in order to enable them to make balanced artistic judgements and form their own artistic tastes and sensibilities, thereby helping them to enjoy historical and artistic heritage to the full. History of Art makes an unparalleled contribution to students’ cultural development. At a time when borders are becoming a thing of the past, Mater Salvatoris School equips its students for developing their aptitudes in a society where the pursuit of higher learning abroad is an ever more frequent option. There are also many students who opt for a bilingual degree, there being no language barrier for them when it comes to choosing a course, and indeed when they embark on their careers. Our students learn grammatical structures and vocabulary, yet the main aim is for this knowledge to enable them to gain insight into the history and culture of English-speaking countries. Our School has received Advantage Premium accreditation as part of The British Council’s Exam Partnership Programme. It also has extensive experience as a Cambridge University learning and examination centre. In order to achieve its objectives, Mater Salvatoris School has developed an internal project aimed at English language mastery, which is assessed by Cambridge examinations as part of the Common European Framework of Reference for Languages (CEFR). The English course includes daily classes across all age groups. Classes are smaller, meaning students are more involved and active, allowing them to interact among themselves and with the teacher. The smaller groups enable the teacher to form a personal relationship with each and every student. Group work and collaboration are encouraged through projects and presentations based on real-life situations and current topics. Teachers are rigorously selected, meaning the department has highly-qualified staff, both native and bilingual. Language educates for life, for without words there is no thought. This is the main inspiration behind the Mater Salvatoris School internal Spanish Language teaching project. Are suitably capable of verbal interaction. Know how to express their opinions. Know how to communicate their thoughts and knowledge. Understand the knowledge, opinions and aesthetic values that are transmitted through written and oral language. Mater Salvatoris School, which has always been known for its high academic standards, offers students the opportunity to further their study of Classical Languages. The School begins teaching Latin in the 4th year of Secondary School, when students are exposed to Latin languages and culture. As well as learning grammar, students study the history, society, religion, myths, art, urbanism and literature of the period. Baccalaureate students may continue their studies in this area as part of the Humanities course. The study of Mathematics is fundamental in terms of learning to think logically and developing problem-solving skills. It is also the key to studying the other applied sciences. Mater Salvatoris School is fully aware of the importance of the subject and has developed an internal project that is incorporated across the various age groups. During these years, numerical reasoning is developed through play and interaction. The use of teaching materials ensures that, with practice and experience, children lay the foundations for learning. At a stage when intuitive thinking begins to expand into logical thinking, the School uses the inductive method to teach Mathematics. Through an active and participatory methodology, personalised teaching is established, which allows each student to learn at their own pace. Mathematics is a fundamental aspect of students’ intellectual maturity. The study of Mathematics is about acquiring knowledge and processes that are close to the student’s own experience and allow them to enhance their mental capacity, exercise creativity, and reflect on their own thought processes with the aim of consciously improving them. Mathematical study concludes at Baccalaureate level, by which time students are fully equipped to approach their university studies with mental rigour and academic robustness. One of the main attractions of this subject is discovering how chemical principles apply to all aspects of our lives, from everyday activities to grander themes, such as the development of drugs and industrial products. This subject is taught from the 3rd year of Secondary School. At Baccalaureate level, Chemistry is optional. The course aims to ensure students receive a grounding in scientific culture, paying particular attention to the phenomena that structure the natural world, the laws that govern them and the mathematical expression of these laws, thereby attaining a rational and overarching view of our environment. The Religion course is aimed at teaching the fundamental ideas of the Catholic faith so that students may us the light of the Gospel to respond to the questions posed by our society. The person of Jesus Christ and his permanence in history through the Church forms the foundation of this course, which also introduces students to Christian anthropology, Catholic morality and the Church’s social doctrine. A solid grounding in the doctrine and absolute fidelity to the magisterium of the Church through the study of the Catechism. Joyous and positive encouragement to follow Christ in one’s own life in order to put the course content into practice. A methodology that is suited to students’ gradual development and demonstrates how, throughout history, the Christian faith has been one of the driving forces behind science, culture and art. In a 21st Century where technology has a presence across all fields of human activity it is vital that we offer our students a basic grounding in Technology. The Technology course is primarily aimed at arousing students’ passion and interest for technological research and the direct application of scientific knowledge to a tangible reality. The teaching method for this course is based on the completion of group projects. 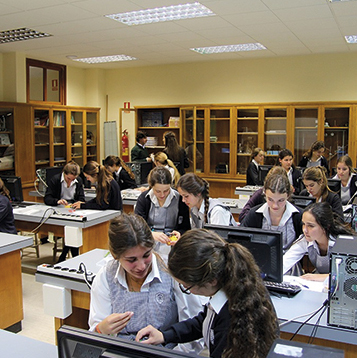 Additionally, there are various extra-curricular activities, such as visits to the European Space Agency (ESA) and NASA, participation in Robotics Week at the University of Alcalá and guided tours and visits of ENRESA, INTA and others.